Today: L.A. Angels at Seattle, 7:10 p.m.
SEATTLE – The Seattle Mariners got an in-your-face lesson Tuesday night in what it takes to compete with the L.A. Angels. The Angels hit balls through the infield holes and to the outfield gaps, and they used their speed to set up runs, stealing five bases in a 6-5 victory over the Mariners at Safeco Field. It left Mariners manager Don Wakamatsu seething, particularly at starting pitcher Felix Hernandez. He said Hernandez’s slow delivery to the plate with runners on base gave catcher Kenji Johjima little chance to throw them out, even though Johjima did get them three times. Four of the Angels’ steals were off Hernandez, including one in each of the first three innings. “Sometimes you have to ask guys to step up and I don’t think he (Hernandez) stepped up today,” Wakamatsu said bluntly. “It’s an embarrassment to allow them to steal five bags off us. The run that made the difference was set up by Maicer Izturis’ steal of second base with one out in the sixth and the Angels leading 5-4. Bobby Abreu followed with an RBI double and the Mariners managed only one more run the rest of the game, on Endy Chavez’s RBI groundout in the bottom of the sixth. Angels relievers retired the last 12 Mariners, including a three-strikeout ninth by closer Brian Fuentes, who pitched for the Mariners early in his career. 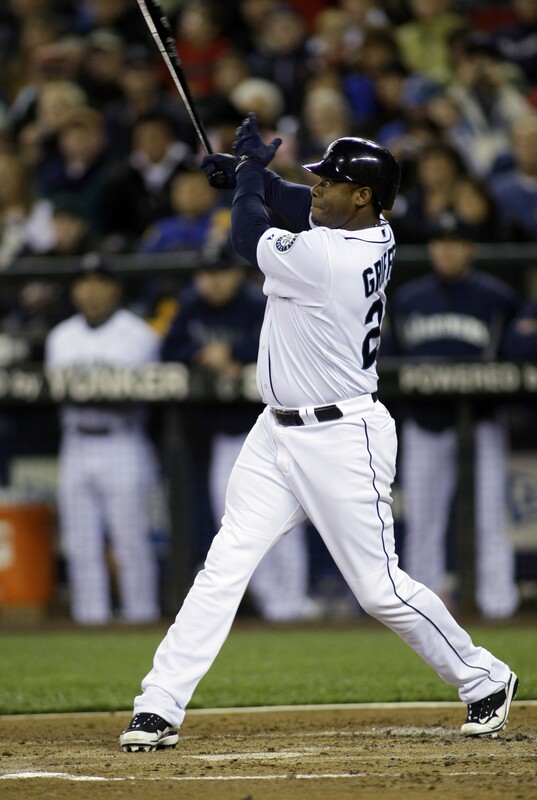 Still, the Mariners showed some life in their offense, especially early when Ken Griffey Jr. hit a solo home run in the first inning and Ronny Cedeno a two-run homer in the second. The Mariners have scored 11 runs the past two games. But they’ve given up 16. This already has been a get-well series for the Angels, who were stunted early by injuries and came here after being swept in three games at Texas. Now they’ve won the first two in the four-game series against the Mariners, who are trying to emulate the way the Angels play the game. And they harass opponents with hitters who get on base and then speed their way into scoring position. That’s what happened Tuesday, when the Angels started running in the first inning, when they scored twice, and didn’t let up. They made Hernandez look like an ordinary pitcher, getting 11 hits and six runs off him in 52/3 innings, twice wiping out Mariners leads. It’s been that way in three of Hernandez’s past four starts, the exception being the seven shutout innings he pitched Thursday in Texas. Hernandez is 4-3 with losses in his past three decisions. The first four Angels reached base in the first inning, when Abreu and Torii Hunter delivered RBI singles for a 2-0 lead. They added another in the fourth, two in the fifth and another in the sixth before Hernandez was pulled after 107 pitches. Wakamatsu also wasn’t thrilled with a fifth-inning error by Jose Lopez, who booted a bouncer up the middle on a potential double-play ball. The Angels went on to score twice in that inning, overtaking a 4-3 Mariners lead. “Our team revolves around pitching and defense and we weren’t good at either at the start of the game,” Wakamatsu said. Foremost on his mind was how the Mariners’ pitchers allowed the Angels to run. Reliever Miguel Batista also allowed Abreu to steal second because of his high leg kick in the ninth, but Hernandez was the prime culprit with a delivery time of 1.5 to 1.6 seconds in most of his deliveries with runners on base. “When you start getting up in the fives and sixes, you have no chance,” Wakamatsu said. “That’s why we talk about showing up, especially against a team as talented as Anaheim. You have to be able to control the running game. Slumping third baseman Adrian Beltre returned to the Seattle Mariners’ lineup one day after Wakamatsu rested him for the first time this season. The third baseman was hitless in four at-bats with two strikeouts. He is now in a 0-for-17 slump. Beltre, who was in his normal cleanup spot in the lineup, took extra batting practice before the game against the Los Angeles Angels, going to the opposite field. Wakamatsu and hitting coach Alan Cockrell watched the entire session. Beltre is hitting .205 with two home runs and 15 RBIs. The Mariners announced right-hander Carlos Silva has been diagnosed with an impingement and fraying of the labrum and rotator cuff in his shoulder. He is expected to get a second opinion from Mets medical director Dr. David Altchek this week. Silva went on the disabled list May 7 with right shoulder inflammation and had an MRI exam on Monday. He is 1-3 with an 8.48 ERA in six starts this season. Los Angeles AB R H BI BB SO Avg. Seattle AB R H BI BB SO Avg. E—Jo.Lopez (7). LOB—Los Angeles 9, Seattle 5. 2B—Abreu (7), K.Morales (11), I.Suzuki (3), Johjima (3). HR—Griffey Jr. (4), off Palmer; Cedeno (2), off Palmer. RBIs—Abreu 2 (16), Hunter (31), Napoli (18), Kendrick (19), I.Suzuki (13), Griffey Jr. (9), Cedeno 2 (5), En.Chavez (9). SB—Figgins (18), M.Izturis (5), Abreu (15), Hunter 2 (8). CS—M.Izturis (1), Hunter (3), Kendrick (1). S—Cedeno. RLISP—Los Angeles 8 (Matthews Jr. 2, M.Izturis, Napoli 2, J.Rivera 2, Hunter); Seattle 3 (F.Gutierrez 2, Jo.Lopez). RMU—Hunter, Matthews Jr., J.Rivera, En.Chavez. GIDP—Jo.Lopez. DP—Los Angeles 1 (M.Izturis, Kendrick, K.Morales); Seattle 1 (Cedeno, Branyan). IR-S—Bulger 1-1, White 1-0. HBP—by Palmer (Cedeno). WP—F.Hernandez. T—2:53. A—16,002 (47,878).